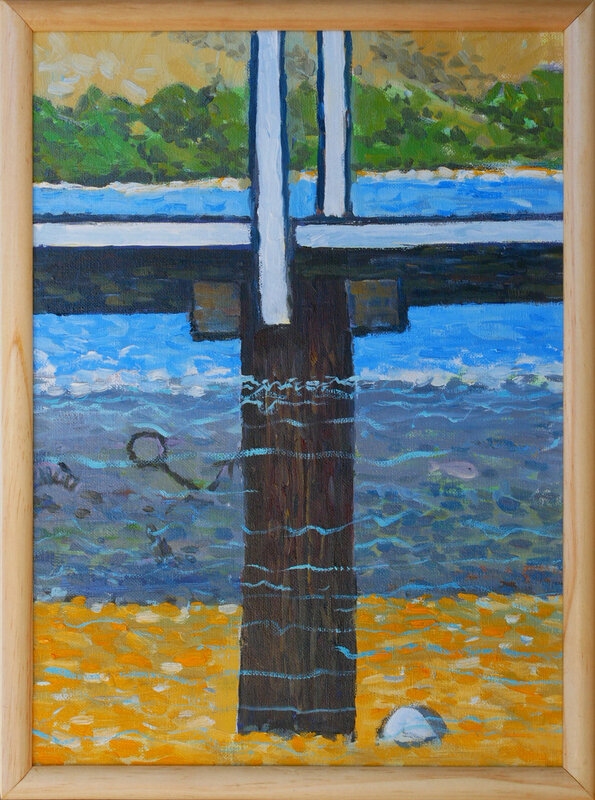 After being asked to create an artwork for our Create to Construct art auction, Reverend Colin Jamieson became so inspired by the form and the significance of the jetty that he created 11 paintings. We chose one for the Create to Construct auction - it sold for $875, 100% of which went towards rebuilding the jetty. Colin gave two sermons featuring the jetty, including one displaying his artworks. Watch the video (2 minutes, 11 seconds). The other 10 paintings are for sale via auction on TradeMe auction. All auctions end at 8pm on Sunday 28 April 2019. Put your bid on now! See our listings. This is wonderful opportunity for anyone who missed out on a piece of jetty art. We will add links to the auctions on TradeMe once the artworks are listed. 50% of the proceeds from sales will go to the jetty rebuild and 50% will go to the artist. On the turquoise blue below. On the other side of birthing. Below the Nor’ West arch. And leaving us to contemplate. How deep is the night. That overflows the canvas and overwhelms the viewer. But the space and place knows well.